A major development that will change the face of University Circle is moving along without much fanfare. The City of Cleveland, the Cleveland Public Library, and private developer Midwest Property Group have put the gears in motion to repurpose the former site of the Third District police headquarters, the MLK branch of the public library, and several parcels of central park space in the heart of University Circle. The ambitious project also involves a total rerouting of traffic through University Circle -- the elimination of the fork separating Chester, narrowing Stokes Blvd. and eliminating a handful of disused access roads to calm traffic and open up land for development. The project could add over 700 apartments, ample streetfront retail opportunities and provide a much more inviting streetscape for pedestrians. 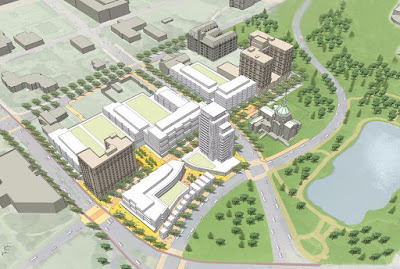 This, combined with the One University Circle project directly to the south, could increase the population of this small area by over 1,500 by next year. Land acquisition is moving forward with UC3 holding companies already having acquired more than half the site including the former city park land in the center of the circle. Land acquired by developer in red.